Yes that is a reference to Game of Thrones and one of the coolest TV characters there has ever been 'The Hound' - I think he single-handely boosted the sales of fried chicken across the country. If you're a fan of GoT, you will know what I'm talking about. If you're not a fan, you're obviously not watching it right; maybe you're facing away from the TV or something, or you have forgotten to open your eyes. Houndstooth Playsuit, Boohoo - Similar Here. Not only do I love The Hound, but I also love houndstooth (check out my linking skills), it is my second favourite print after leopard print, I love me some streetwalker chic. Monochrome is so easy to wear, as it suits all skin tones and is flattering to all body types, so I don't think any girl can be without a little bit in their wardrobe. The super cute houndstooth playsuit from Boohoo was an eBay bargain at just 99p - it was like new and such a lovely soft material. It did come with a matching tie belt, bu I decided to add a pop of colour with a neon plaited belt from New Look. Red lips are always a monochrome must, although I would wear red lipstick with my pajamas. It seems like houndstooth is going to be one of the key trends for the Autumn/Winter season, so I have picked out a few of my favourite high street finds, in case you feel like getting in on it. The Hound: 1) Houndstooth Blanket Wrap, New Look; 2) Herschel Clutch Bag, ASOS; 3) Houndstooth Shirt, Topshop; 4) Chenille Houndstooth Mini Skirt, Marks and Spencer; 5) Houndstooth Loafers, Peacocks. 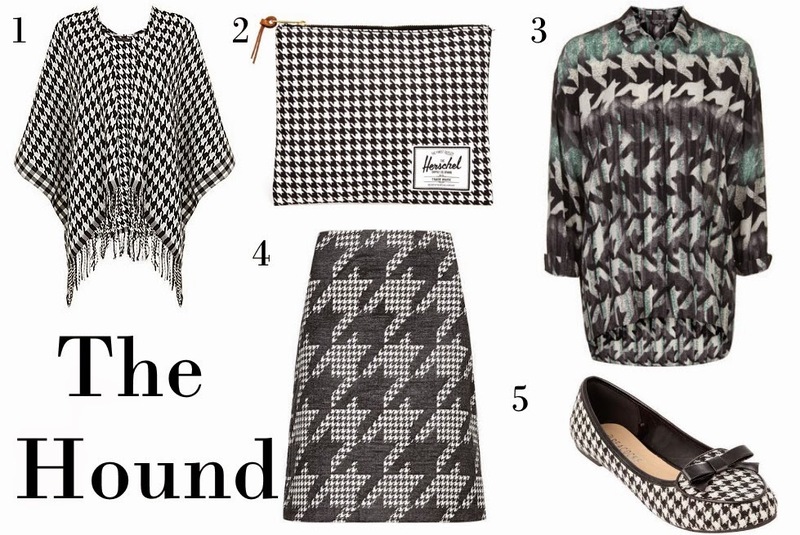 What do you lovelies think about the houndstooth trend? I didn't know what to make of the hound at first, but in seasons 3 and 4, I really did warm to him and his one liners. Loving the GoT reference, you look amazing, the print looks lovely on you! Such a cute print and loving those flats!! Looks amazing… great houndstooth romper!